Fifty Shades Film: Fifty Shades Film's 1st Ultimate Fifty Shades Fan Package Giveaway! Fifty Shades Film's 1st Ultimate Fifty Shades Fan Package Giveaway! We are excited to announce our ULTIMATE FIFTY SHADES FAN PACKAGE GIVEAWAY! Fifty Shades Film had the opportunity to be at the E.L. James Book Signing Event in Los Angeles, CA. But we weren't just there just to get books signed for ourselves, we were there to get books signed for you too! 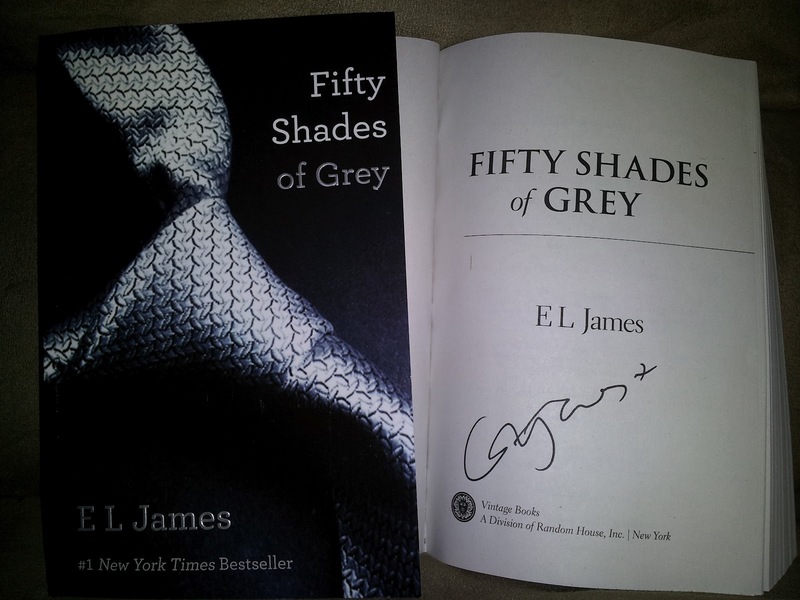 We want to offer you a chance to win a Fifty Shades of Grey book autographed by E.L. James... BUT THAT'S NOT ALL! We have teamed up with Taboo Essentials at MyRomanceLady.com to add a "Grey Experience Kit" which makes this the ULTIMATE FIFTY SHADES FAN PACKAGE! - Taboo Essentials "Explore Your Grey Side Kit"
We will give away the complete prize package to ONE LUCKY WINNER as soon as @FiftyShadesFilm hits 50,000 followers on Twitter! Tell everyone you know to follow us because the sooner we get to 50,000 the sooner we give away this amazing prize. To enter, all you have to do is follow @FiftyShadesFilm AND @MyRomanceLady A winner will be chosen randomly from our total list of followers. Over the next few weeks, we will be holding additional contests exclusive to our Facebook and Sulia users. Make sure you are following us on Sulia and Like Us on Facebook to make sure you don't miss the details. That's a total of three chances to win amazing Fifty Shades of Grey prizes from Fifty Shades Film. *No purchase necessary. Prizes subject to change do to availability at the time of contest completion, similar prizes will be substituted for those listed on this contest page. Winners will be chosen at random from the total list of followers at the time of the drawing. Contest will continue until Fifty Shades Film reaches a total of 50,000 followers on Twitter. To qualify, followers must follow @FiftyShadesfilm and @MyRomanceLady. After verification that winner is following both accounts, winner will be notified via twitter. Oh my God!!! Please pick me! I love the prizes!especially the silver orgasmic ball!